Antaeus Theatre Company’s The Cripple of Inishmaan could be celebrated as ‘the most wonderful play of their season’. The silliest of expressions, but considering its ultimately delightful nature, it fits. 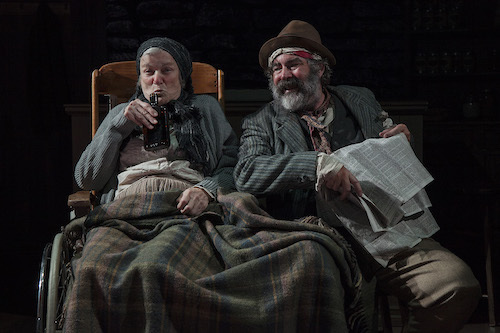 Noted occasionally as a black comedy by playwright Martin McDonagh, linking to the real-life filming of the documentary Man of Aran, Cripple is in fact, one of the easiest plays to sit through with digestible relationships and a happy ending for the lead character. You could not want much more than that for an entertaining night at the theater. Set on the Western Coast of Ireland in 1934, the Inishmaan inhabitants learn of a Hollywood film crew’s arrival to neighboring Inishmore, which inspires more than one eager hopeful to make a secret trip over to the island in order to be cast in the production. One of them is orphan ‘Cripple’ Billy Claven (Ian Littleworth), raised by two spinster sisters Kate (Rhonda Aldridge) and Eileen (Julia Fletcher), who desperately wants to escape the boredom and cruelty of Inishmaan. Billy invents a lie to gain passage on a boat with the girl of his dreams, a rather rough Helen McCormick (Emily Goss) and her brother Bartley McCormick (Sebastian Fernandez), who also want to be in the film. The turn of events that follow is nothing short of tragic and triumphant for more than one person. Thematically, it’s a bit of a toss-up as to whether this play is a comedy, a romance, a tragedy, irony or satire. It is as comical as it is bleak and it narrates a complicated path into the ethos of people. Complicated in that people in general, along with their loves, hates, and jocularities are not black and white. Words of affection are always inexplicably intertwined with biting gruffness that mutually expresses happiness and sadness, love and hate. This, as plays go, does little to distinguish any sort of archetypal characteristics of the populace of Innishmaan except the particular nuances of the Irish people (in this instance). And so, we are guided by their ever-shifting relationships and seemingly uneventful lives without a lot of hyperbole, exquisitely played by the Antaeus cast who do in fact, capture quite well, the particular humor and dialogue accents of the Innishmaan folk while moving an almost bare bones story along a single location stage without ever scenically leaving the shores of Innishmaan except for Billy in America. It’s really, really good. And it’s really, really believable. There is a singularly stand-out performance in this production by Anne Gee Byrd as Johnnypateenmike’s drunken Mammy. Byrd is spot-on (like…if you grew up with Irish cousins in Boston, and knew someone’s curmudgeonly grandmother from Charlestown or Southie like me, Byrd’s portrayal is recognizably and hilariously, dead-on precise!) from the truth externalizing, caustic banter to the gritty attitude of living for a nip of the drink in a dreary place where nothing ever happens. The Cripple of Innishman under the direction of Steven Robman is beautifully done.